Almost seven years on from its launch, the Lexus CT 200h is undergoing its most significant upgrade yet, with new styling inside and out, and advanced safety features. Lexus says the CT200h remains a unique player in the luxury car market, a compact, petrol-electric hatchback that delivers premium quality, clever packaging and exceptional fuel and emissions performance. In the UK, it has amassed more than 27,000 sales – more than one third of the total sold across Europe. Safety has been a prime consideration, with the introduction of the advanced Lexus Safety System+ to the range. One feature is the reworking of the frontal design. The daytime running lights keep their arrowhead pattern, but on the Premier and F Sport Premier Pack models they have been repositioned so to sit above the single-projector bi-LED headlights, creating a continuity of styling with the character lines that flow down each side of the car. The grille has a new mesh pattern made up of individual spindle shapes, and has more prominence thanks to the removal of an integrated bumper section that used to divide its upper and lower sections. Detailed touches include new metallic grey bezels for the fog lights, set in sharp-edged surrounds. There are changes at the rear, too, with new Lexus L-shaped taillights intended to create a wider, sportier look. These are now all-LED units, with the turn indicators moved to the lower edge of the unit, strengthening the overall L-motif. A new tailgate garnish has been added with a rearward flare, surrounding the Lexus emblem between the rear glass and the taillights. The lower part of the rear bumper has been reshaped and given a new metallic silver and black finish. The rear reflector bezels have a metallic grey finish to match the front fog lights. 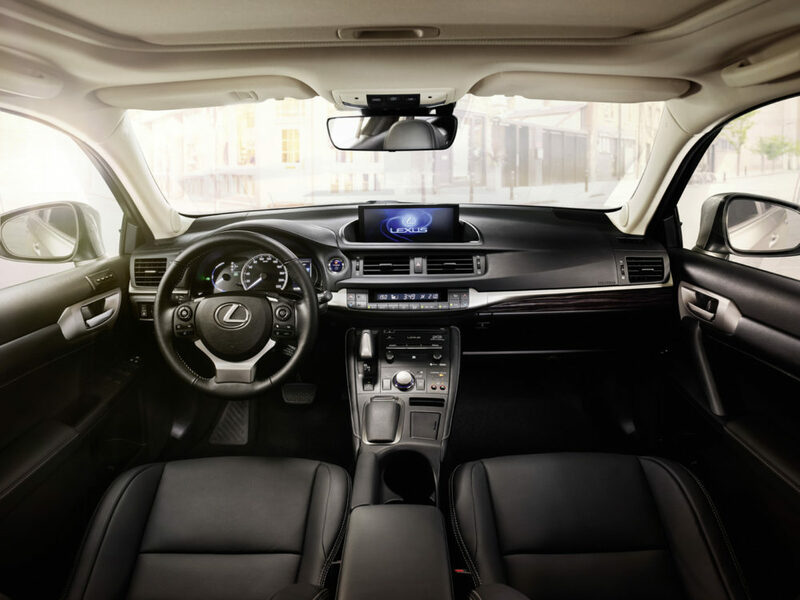 Inside, the Lexus Premium Navigation System (standard on Premier grade and F Sport with Premier Pack, optional on Luxury grade) benefits from a larger screen, increased in size from seven to 10.3 inches for a clearer display and greater ease of use, including a split-screen function. Customers can also choose from a wider colour palette for the range of upholsteries, which includes two-tone smooth leather, combination fabric and durable Tahara leather-effect material and a new all-fabric option. Leather options include White, Sandstone and Red with contrasting black edging along the sides of the front cushions, seatbacks and headrests. The CT Hybrid F Sport benefits from specific changes that include an exclusive new mesh pattern and metallic black finish for the spindle grille. The same mesh design is used as a backdrop for the fog light inserts and surrounds. Also exclusive to the F Sport, the upper and lower sections of the grille moulding have a new jet black plating, while there is a new metallic black lower trim garnish. New high-grade headlights house a single projector high/low beam lamp. For 2018, the CT 200h F Sport will be available with two distinctive new colours – Solar Flare and Azure Blue. These shades, plus Fuji Red and F Sport White can be combined with a contrast black roof (styled differently from the bi-tone models). In the cabin F Sport-exclusive combination finishes are available, including two-tone leather upholstery and Naguri-pattern trim details. Lexus has taken the opportunity of the revised CT 200h hybrid’s launch to simplify the model’s grade structure. The company says the SE grade is presented as an affordable entry point to the line-up, equipped with features such as dual-zone air conditioning, new-design 16-inch alloy wheels, rain-sensing wipers, Drive Mode Select, reversing camera, six speaker audio and seven-inch Lexus Media Display with rotary controller. Customers can raise the bar with the SE Plus Pack, which adds Lexus Safety System+, 17-inch wheels, rear parking sensors and Lexus Navigation. The new Luxury grade adds 17-inch alloys Smart Entry, heated front seats, rear privacy glass, front and rear parking sensors and Lexus Navigation. 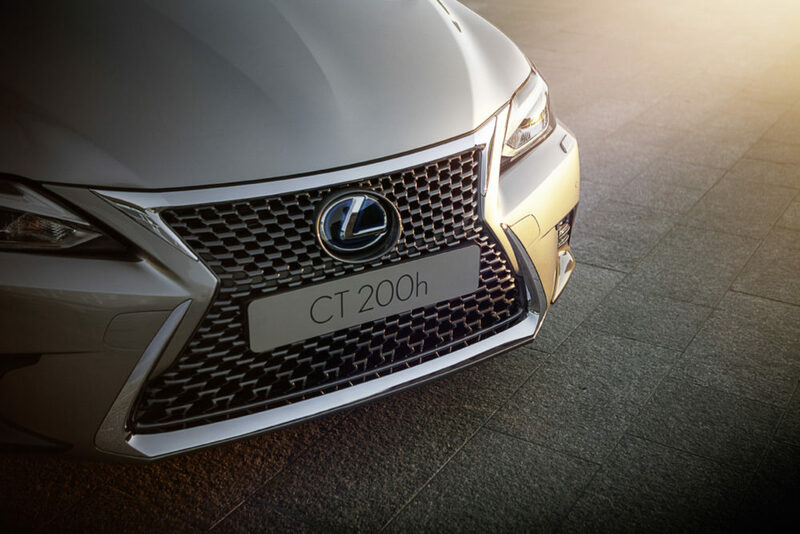 The CT 200h F Sport gains specific sports styling elements inside and out, performance dampers, an auto-dimming rear-view mirror and Lexus Navigation. Adding the Premier Pack to the F Sport specification introduces heated, folding, auto-dimming door mirrors, F Sport leather upholstery, 13-speaker Mark Levinson Surround Sound system, LED self-levelling headlights, Lexus Premium Navigation, smart keyless entry and front and rear parking sensors. These additional items are also included in the CT 200h Premier specification at the top of the range. The updated Lexus CT Hybrid adopts Lexus Safety System+ on all versions above SE grade, a set of active safety features that can help prevent or mitigate collisions in a wide range of traffic situations. Its advanced technology features include a Pre-Collision System, Adaptive Cruise Control, Lane Departure Alert with Lane Keep Assist, Automatic High Beam and Road Sign Assist. Lexus says the CT 200h Hybrid’s powertrain is unchanged, yet continues to be the leader in its segment in CO2 emissions, with official combined cycle figures from 88g/km (using 16-inch wheels), and also addresses increased customer awareness of air quality issues with low NOx and near-zero particulate emissions. Even though the system has a maximum power output of 134bhp, its official fuel economy figures rival more modest competitors – from 74.3mpg (combined). Benefit-in-Kind company car tax ratings are from 17 per cent. The 2018 Lexus CT 200h is on sale now. Full range and prices are shown below.